Our workplace culture, employee skillset and PMO practices are changing in ways we have not witnessed since the early 19th century. To be a future-ready manager, we need to learn the necessary management skills to adapt to these changes. An assessment has been made on three famous philosophers’ approach to leading and the subsequent PMO solutions that are required in a workplace to achieve business goals. Drawing on these philosophies can guides managers to reach their leadership aspirations. is the Greek philosopher who believed in Heroism and a society bound by roles. Based on this Homeric philosophy, you are defined by your actions in order to assert your ‘Hero’ status. In a Homeric organisation, obtaining PMO solutions and its scope of influence within this hierarchy is often limited. PMO services and efficient office management is a double edge sword in this management style. Are you a heroic leader? 1- Do you like to swoop-in and save the day? 2- Do you see yourself as the leader who can solve any problem or challenge? 3- Do you believe on top-down reporting line hierarchy? 4- Do you believe that “If you want it done right, do it by yourself”? 5- Do you believe that you can do everything better that anyone else? If you answered ‘yes’, your management philosophy is Homeric. To position yourself favourably for future success you may need to alter your management approach to focus on two-way communication, meet and respond to questions and engage with challenges / conflicts, viewing these as opportunities to learn from. believed a leader is a human instructor who needs to omit the conflict between its segments to create an ideal state. This is called the FORM theory, which is the ability to see the good, be better and seek the truth. A vital task as a PMO manager is to educate and assist people to achieve their strategic objectives. . Training and mentoring should be one of the PMO strengths in your organisation and PMO solutions should be delivered with adequate training and performance measurements. 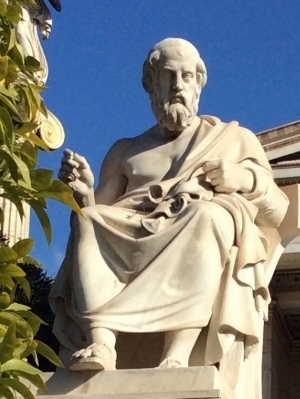 Are you a Plato-based leader? 1- Do you believe in peak performance? 2- Do you consider the knowledge as a virtue? 3- Do you believe in education so that it may be a better way to discover the truth? 4- Do you see yourself as committed true role model? 5- Do you believe in reasoning? If you answered ‘yes’, your PMO leadership approach is emerging in Plato’s Idealist theory. To be successful in this position, you must obtain the charismatic ability to influence people, be a good listener, be patient and have passion to educate people while designing PMO Solutions and Services. Hume is one of the philosophers who believed in Empiricism, claiming that learning is acquired by observation and result of our perception. Hume also argued that our understanding of whether an action is right or wrong should be based on the response that it receives. An organisation with Hume philosophy management supports PMO in developing solutions and services by engaging different SMEs across the business. To be successful with this type of management philosophy PMO needs to be a role model of facilitation, requirements management and stakeholder management skills and competency. Am I a leader with Hume philosophy? 1- Do you consider truth based on observation? 2- Do you sympathise with people and their circumstances? 3- Do you consider probabilities? 4- Are you open to others' experiences? 5- Do you trust people's thoughts and impressions? 6- Do you involve people in making decisions? If you answered ‘yes’ to these questions, as a leader you will need to set clear goals and objectives, monitor the time it takes more for group decisions to be made, evaluate solutions and can clarify peoples roles. This philosophy provides an effective way to generate new ideas, but without proper management, it can also lead to improper solutions. These cannot be achieved unless we as leaders educate and evaluate ourselves constantly and be a leader that people follow because of who we are and what we represent.